Freedom From Jail… Freedom From Family. Jensen Keller covets freedom. He’s abided by his father’s wishes for years, until the one time he rebelled, and it nearly lost him his family. Now he’s summoned back to Cathedral Lake only to discover freedom has been granted to the one person who should be denied it—Wade Unger, the man responsible for his sister’s death. Bella Perish wants nothing more than to be free from her domineering father. In an unexpected turn of events, she’s not only granted that freedom—autonomy is forced on her… at the cost of her budding relationship with Jensen. As she works to repair the relationships that matter most to her, her newfound independence is compromised. Worse, her very life is threatened. 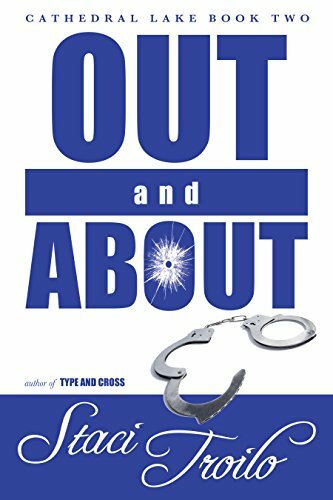 Several years have passed since the first book in this series, Type and Cross, and Out and About continues with the Keller family, focusing more on Jensen. This book could work as a standalone – however, I’d recommend reading the first. This author knows how to craft a story, revealing tidbits of a secret on one page, a dramatic twist a few chapters later, subtle hints of what’s to come – everything that makes a reader say, “Just one more chapter and then I’ll sleep/do laundry/feed the cat, etc.” And the conflict! The challenging family dynamics in this story – father/son, father/daughter, mother/daughter and more – could make your head spin, and most readers will be able to relate to this in some way. Jensen’s relationship with his father is strained at best, and with Bella, a young attorney learning to assert her independence, he finds common ground. The two are determined to learn the secrets behind the suspicious parole of the person responsible for his sister’s death. If you’re a fan of family drama and mystery/suspense, this series is for you. Now to move on to the third book! Thoroughly enjoyed it, Staci – Jensen was one of my favs from the first book, so I was glad he was the focus of this one. Now just need to squeeze in the third! An excellent review, Teri. Jensen was such a great character, but then I grow attached to all of Staci’s characters. This whole series is excellent. You’re going to love book 3, Pride and Fall equally well! Thanks, Mae! Staci makes it very easy to get attached – I’m hoping to see more of Jensen and Bella in the third book, but I’m also interested to learn more about Faith. Hearing that you get attached to my characters is one of the best compliments you could give me. Thank you so much. Wonderful review, but I had no doubt. I read the first one and really enjoyed it. Thanks, Craig – you’re more behind than I am. It may always be that way. Thank you for taking a chance on that book, Craig. I know it’s not your typical genre choice, and that makes it all the more thrilling to me that you enjoyed it. I really did, and the writing was superb. Thank you, Don, for sharing Teri’s review of my novel. I appreciate it. A lovely review of this book, Teri. I love dramas. Thanks, Robbie – if you like dramas, I’d highly recommend this series.